There’s a story behind this song “Love & Shine”. During Project Shine Summer Trip in 2014, one of the team member Michelle Ko played guitar with some chords while our Multimedia & Project Officer Deakin Ng and the other member Rebecca Lee were humming a melody, and that is how they started to write the song together. Deakin believed that this was a song that belongs to Project Shine, after several twists and turns, he finally wrote the lyrics in 2016. At this time suddenly an interesting thought cross Deakin’s mind, what if this song can be sung and recorded by a Chinese student who had participated in Project Shine? 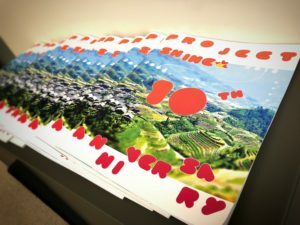 Deakin suddenly remembered a girl named Cici Chen in Guangxi Rongshui during Project Shine in 2014. He still remember how she hold a water bottle and sing an English song in the classroom with her beautiful voice. But it is a pity that we are separated by two places, it was like an impossible dream to be able to record her voice. But one day, she suddenly sent a song she had recorded with her friends to Deakin and the quality of the recording was very good. So Deakin asked her if she could sing the song and record the song “Love & Shine” in China and she replied yes! Just like that, the result of this beautiful cross-cultural exchange became a blessing for today. This is how we love, like stars in the sky. Forever, lighting up every life, this is how we shine. Holding hands together, sharing love to others. Love and shine, this is our fountain of joy. Strength comes from our will to give, love and shine. Our smiles will forever shine, facing the storms and the waves. One day we will grow up, you and me will encounter different challenges. Do not stop smiling, do not hide your love.